Throughout our blog you have heard us speak about the longevity of pavers, their durability as well as sustainability. Like any product, pavers will last substantially longer if they are taken care of. While pavers are relatively low maintenance, there are steps that one can take to insure that they have a long life and retain their beauty. 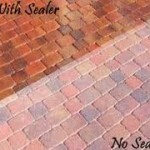 One of the ways to protect your pavers is by putting on a sealer. A paver sealer will help protect as well as assist in keeping them clean and extending their beauty for many years. Any easy way to think of paver sealer is to think of it as a type of protective coating – essentially an extra layer of protection. Therefore, if the paver become marred with oil or grease it is much easier to clean. As always, the paver can simply be popped out and replaced if the stain can not be removed. In addition to the protective coating that sealers add to pavers, they enhance the look of a new paver driveway or walkway. Sealers give pavers a clear gloss type finish which also serves to enhance the natural colors of the pavers while at the same time creating a barrier of protection. While some homeowners may not see immediate value in sealing pavers, a sealer will increase the lifespan of your pavers and add to the overall beauty and color intensity of each paver. With paver sealers, there are two main types of sealers: Film Formers and Penetrants. Film Formers create a glossy type finish on your pavers and protect your pavers by blocking water and other materials from effecting the integrity of the paver. 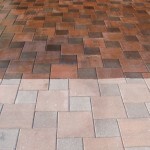 Film Formers are often thought to enhance the color of the paver and prolong the “new paver look”. 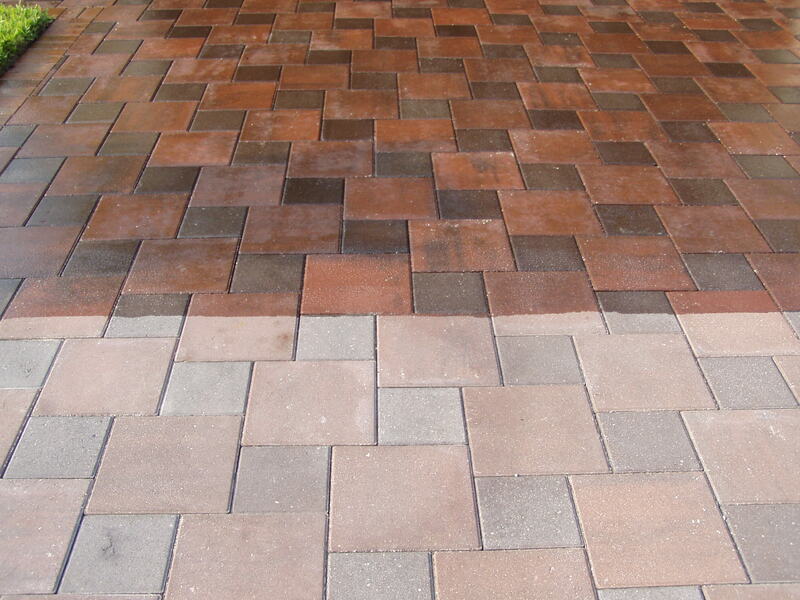 The second type of sealer that is used in paver applications is known as “Penetrants”. Penetrants are a type of sealer that physically penetrates into the paver itself (approximately 1 to 4 mls deep). 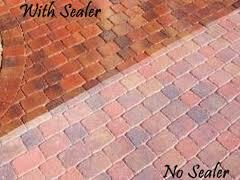 This type of sealer repels water and will help the paver resist against material that could stain. In addition, Penetrants will extend the life and beauty of your pavers as well as increase their durability. So at this point you are probably thinking, “sealing my pavers sounds like a pretty good idea, but can sealers be used on all types of pavers?” To which we would say, excellent question! Sealers can be applied to pretty much any type of surface material. This even includes concrete, granite, slate, clay, natural stone, stamped concrete and block pavers. Sealers can be applied anywhere these materials are present – and you should. It doesn’t matter if you have a balcony that doesn’t see a whole lot of traffic – it should still be sealed! This entry was posted in Paver Sealer and tagged paver driveway, Paver sealers, protective coating, protective paver finish, sealer. Bookmark the permalink.